The 22-year-old will enter double figures as a professional when he bids for a tenth straight victory, following on from his most impressive performance to date when he outfoxed the experienced Ryan Farrag by a shut out margin on two of the judges’ cards at York Hall last month. The win put a marker down in the super flyweight division for the currently Sheffield-based former Team GB member who hopes to place himself into contention for a shot at the British title to go alongside his WBO European belt. 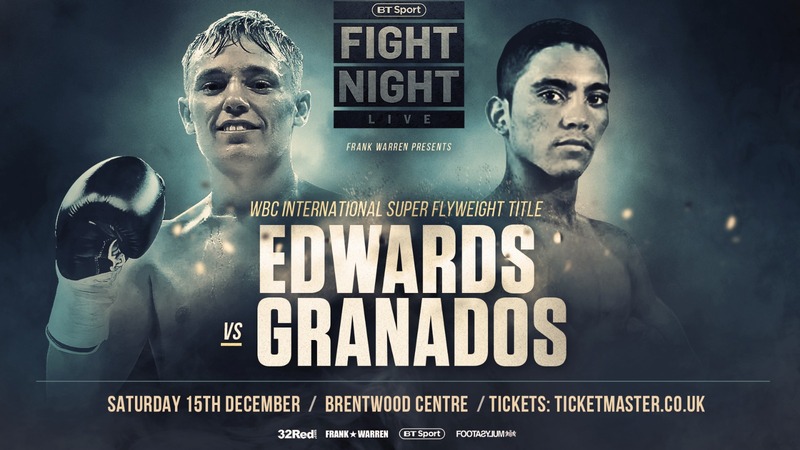 Grenados is best known to UK and Ireland fight fans for his only fight outside of his native Mexico when he engaged in an absolute war against Jamie Conlan in Dublin in July 2015. In a truly compelling encounter, Conlan was down and virtually out after being floored twice in the seventh round to body shots and then on the brink of stoppage when he was forced to fend off a flurry of shots that left him rocking on the ropes. Against the odds, Conlan re-established his composure and, with the crowd behind him, finished strongly to clinch a decision on the cards that was disputed by the Granados camp. The 25-year-old has since recorded three wins – with one defeat via split decision – and holds a record of 16-5-1. Two of the wins were against the world ranked Aston Palicte (20-1 at the time) and the previously unbeaten Roque Mex (16-0-1). “He had a war with Jamie and had him down a couple of times – but Jamie still got the win – and since then he has had a good couple of wins,” said Edwards on his next assignment. “They were two opponents with very good records, so Granados is definitely going to come and have a go. His record is probably a bit misleading with a few losses on it but he has fought top people and this is a good level fight. “When it was offered to me I did what I have done with every one of my opponents, or potential opponents, and that is say yes. I haven’t said no to anyone and I think that is getting obvious now because there are a lot of easier fights I could have taken than Junior Granados. “Coming off of my win over Farrag it was put to me by my promotional team that they wanted me on a TV bill to build up my momentum and that is what I need more than anything, along with the exposure of performing on BT Sport. 9-0 Heavyweight sensation Daniel Dubois faces former World Title challenger Razvan Cojanu (16-4) on the BT Sport televised show from the Brentwood Centre. Former British Welterweight champion Bradley Skeete also returns and seeks to restore his name in the world rankings.